Do policy failures inevitably lead to electoral punishment? This paper examines the role of immigration in the 2015 UK general election to argue that policy failure can be electorally successful. In the 2010 election, the Conservatives had committed to reduce net migration to under one hundred thousand. As majority partners in the 2010-15 Coalition government, they failed spectacularly to achieve this, overseeing a substantial increase in net migration. By 2015 immigration was highly salient and the electorate wanted it reduced. The paper argues that the Conservatives won a majority not despite their migration policy failure, but in large part because of it. Their failure to reduce immigration and address public anxiety contributed to the emergence of UKIP as an anti-immigration party, a development which disproportionately harmed Labour in the 2015 election. UKIP’s anti-immigration message helped the Conservative win victories in a number of key marginal constituencies, thus contributing to their unexpected majority. Les politiques publiques qui manquent leurs objectifs mènent-elles inévitablement aux échecs électoraux ? Cet article analyse le rôle de l’immigration dans les élections législatives de 2015 pour montrer que les objectifs manqués peuvent contribuer à un succès électoral. Lors des législatives de 2010, les conservateurs s’étaient engagés à réduire les chiffres nets de l’immigration à moins de 100 000. En tant que partenaires majoritaires dans le gouvernement de coalition de 2010-2015, ils ont échoué de manière spectaculaire à atteindre cet objectif, et ont vu au contraire une augmentation substantielle de l’immigration nette. Cet article montre que les Conservateurs ont gagné la majorité en 2015 non pas malgré cet échec en matière migratoire, mais en bonne partie à cause de lui. Leur incapacité à réduire l’immigration et de répondre aux anxiétés de l’opinion sur le sujet a contribué à l’émergence de UKIP comme parti anti-immigration, ce qui a nui de manière disproportionnée aux travaillistes. Le message anti-immigration de UKIP a facilité la victoire des conservateurs dans un ensemble de circonscriptions marginales cruciales, contribuant ainsi à leur majorité inattendue. 1One function of elections is to enable voters to provide their collective judgement of the incumbent government. In making this judgement, it seems reasonable to assume that the government’s policy record – its successes and moreover its failures – will play a role. However, whether or not voters reward or penalise parties for delivering or failing to deliver on their policy promises is likely to depend on at least two factors. Firstly, all things being equal, a policy success or failure is more likely to matter when the policy in question is publicly visible and widely known. If a party is able to obscure its poor record on a particular issue – for example by highlighting other issues – or if its record has not been widely debated and scrutinised through the mass media, then it is more likely to escape electoral punishment. Secondly, and related to the previous point, policy success or failure is more likely to matter if it relates to an issue that voters care about. In other words, a government’s record will matter more on issues that are highly salient and about which voters express clear and strong preferences. 2These conditions were all met regarding the Coalition government’s immigration policy record in the run-up to the 2015 UK general election. In 2010, the Conservatives had committed to reduce net migration from hundreds of thousands to tens of thousands – “no ifs, no buts” as David Cameron put it. Over the five years of the Con-Dem Coalition, they failed, and failed spectacularly, to do so. Not only did they not meet their own target, they actually presided over an increase in net migration, to a figure significantly higher than Labour’s final years in office. In the latter years of the Coalition this failure was widely observed in the media and, as we will see, at least one political party made it central to its attack on the Conservatives. Yet rather than hide the issue, the Conservatives recommitted themselves to the net migration target in their 2015 manifesto. This was all the more surprising because by 2015 voters considered immigration to be the second most important issue facing the country (after the economy) and the majority of them thought that immigration was too high. Given all of this, it might have been expected that voters would punish the Conservatives at the ballot box. 3In the event, the Conservatives’ record on immigration did not appear to harm their election result. In one of the biggest upsets in British electoral history, the Conservatives outperformed every pollster’s predictions – for reasons that are still unclear – and win an outright majority. Pollsters were so confounded that the British Polling Council launched an inquiry (on-going at the time of writing) into how they got it so wrong. A complete explanation of why the Conservatives did so well and Labour so badly is, of course, complex and multi-faceted and would require attention to a number of factors: the SNP’s surge leading to Labour’s collapse in Scotland; the Conservatives benefiting disproportionately from the Lib Dems’ collapse throughout the UK; Ed Miliband’s poor approval ratings; and the Conservative’s effective (though false) economic narrative that blamed the deficit on Labour’s supposed profligacy before the 2008 financial crisis (see for example Bale and Shaw’s contributions to this volume). So it could be that immigration was simply outweighed by these other factors. In other words, the Conservatives did well despite failing to meet their own migration target, the counterfactual being that they would have done even better had they met the target. 4While intuitively plausible, I think this is incorrect. In this paper I want to argue that in fact the Conservatives won a majority not despite their immigration policy failure, but in large part because of it. In other words, their failure to reduce immigration and address public anxiety about this issue should be added to the list of reasons why they won, rather than considered as a factor that they overcame to win. How so? 5We have to go back to the previous election in 2010 to understand how the Conservatives set themselves up to fail, yet succeed. 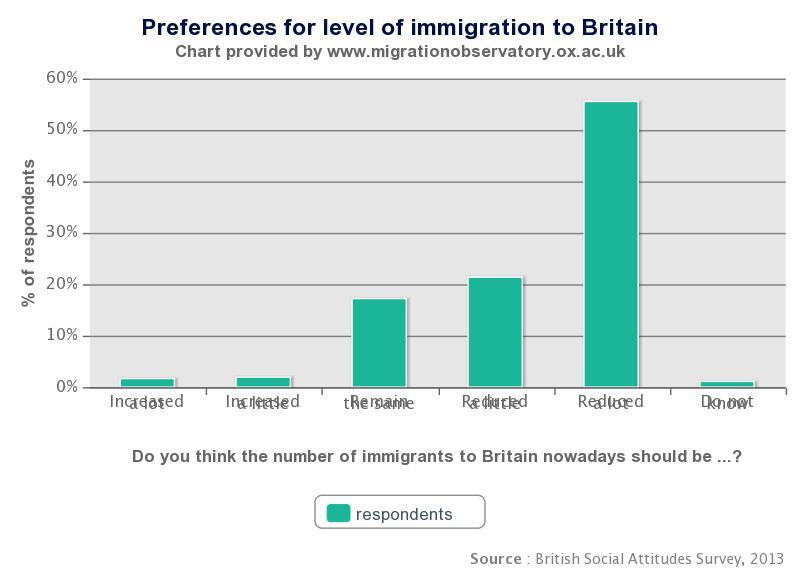 Then as now, the Conservatives enjoyed a lead over Labour on immigration. Voters had lost trust in Labour’s ability to manage migration and since the 2004 EU enlargement resulted in large increases in immigration to the UK attitudes had hardened. As the 2010 election drew near, the Conservatives were keen to exploit their advantage on this issue. At the same time, they faced a threat from the right, in the form of the United Kingdom Independence Party (UKIP), which since 2005 had increasingly campaigned on an anti-immigration message. Thus both in its competition with Labour over the centre ground, and in its efforts to prevent defectors to UKIP on the right, a robust policy on immigration seemed essential to any Conservative victory. 6The challenge was to articulate such a policy without falling into the trap of appearing as the “nasty party”, as arguably the Conservatives had done in the 2005 election, when the party used none too subtle dog-whistle posters on immigration asking “are you thinking what we’re thinking?” and moreover promised in their manifesto to withdraw Britain from the United Nations Refugee Convention. In the party’s 2005 election post-mortem, this draconian approach immigration was identified as having discouraged some swing voters from voting Tory and thus contributing to defeat. The new Conservative leader, David Cameron, had committed to modernise the party, precisely aiming to shed the “nasty” image and make it more appealing to centrists. So Cameron needed an immigration policy that was tough enough to exploit the party’s advantage over Labour and prevent defections to UKIP, yet not so tough as to jeopardise his modernisation strategy. 7The solution was the net migration target. Cameron first announced in a television interview that if elected his party would reduce net migration “from hundreds to tens of thousands” in the course of the next Parliament, a promise that was then included in the Conservative Party manifesto. At the time, net migration was 255,000 per year, so Cameron had effectively committed to more than halving it in the space of just five years. The target sounded robust – it after all committed the party to very substantially reducing migration to Britain – yet it did not demonise immigrants and had a pleasing technocratic ring to it (even if in reality it was endorsed by hardly any experts). Of course, in the 2010 election the Conservatives did not win a majority, but they were the largest party and entered into negotiations with the Liberal Democrats over the formation of a coalition government. In the Coalition Agreement, the net migration target was not included as the Lib Dems would not endorse it, but it nevertheless became de facto government policy, clearly driving a restrictive policy agenda on students and family migration, and to a lesser extent work migration. 8Although it made sense politically, the migration target was at best a hostage to fortune. Net migration is simply immigration minus emigration. Democratic states cannot effectively control emigration: neither by forcing people to leave nor preventing them from doing so. Short of becoming an authoritarian state the emigration half of the net migration equation is thus outside government’s control. The immigration side of the equation is in principle more controllable, but there are important limitations here too, not least since a significant proportion of immigration to the UK comes from other EU countries. So long as it remains part of the EU, the government has no effective control over this inflow which is guaranteed by European free movement rights. Immigration from outside the EU is more controllable, but (as discussed below) there are real constraints on government even here. 9For these reasons, many commentators and academics (including this author) said at the time that the target was effectively impossible to achieve. It was certainly difficult to see how the Coalition could both secure an economic recovery (where relative economic strength would attract immigrants, especially EU free movers) and reduce net migration to under 100,000. Thus two of the Conservatives’ central commitments seemed incompatible, if not flatly contradictory. The same commentators who pointed this out also typically argued that the target would come to haunt the Conservatives. While it might have paid electoral dividends in 2010, they claimed, the target would soon become an electoral albatross, costing votes at the next election. In hindsight, while critics were right to observe that the target would not be achieved, they were wrong to think that this would be politically costly (as we shall see below). 10Initially, it looked as though the government might get close to the target. Net migration fell during the first two years of the Coalition, reaching a low of 153,000 in the year to October 2012. From late 2012 onwards, however, net migration started to increase again. By the end of 2014, the last figures released before the election in May 2015, net migration was 318,000.1 This was not only three times the target and 63,000 higher than when the Coalition was formed, but higher than at any time since 2005. 11The failure to reduce migration below the level when they entered office, let alone achieve their self-imposed target, was certainly not for want of trying. The Coalition government introduced a slew of restrictive policies across the spectrum of routes.2 Work entry routes were closed or tightened, and an annual cap was put on the number of skilled workers that employers could recruit. Businesses, and even some foreign governments, complained loudly about these changes, and indeed managed to extract some significant concessions, but there is little doubt that policy on non-EU labour migrants tightened under the coalition. And this was notwithstanding a Liberal Democrat Business Secretary, Vince Cable, who fought a running, and often public, battle over immigration policy with Teresa May at the Home Office. The changes were more dramatic in the areas of international students and family migration. The financial requirements for sponsors of family migrants were increased, as were English language requirements for foreign spouses. Financial and language requirements were also raised for overseas students, and new restrictions were put on students’ rights to work or bring dependent relatives. 12These policies failed to reduce net migration for three main reasons. First, and most important, was the substantial increase in the number of EU citizens migrating to Britain. While free movement to the UK had dropped off in the immediate aftermath of the 2008 financial crisis, especially from Central and Eastern Europe, it picked up again as the UK labour market, while hardly booming, was in better shape than many other EU countries. In particular, the crippling effects of the Eurozone crisis on southern European countries – where youth unemployment reaching staggering levels of up to 50 per cent – created a new flow of young Europeans in search of work. Cafes and restaurants in London were inundated with university-educated Spaniards, Portuguese, Greeks and Italians fleeing their ravaged economies. Second, even non-EU immigration, which was affected by all the policies above also increased. The reasons for this are complicated but again reflect the relative (if not absolute) strength of the British economy, especially after the Chancellor eased back on austerity in 2012, as well as the path dependent nature of non-work migration routes. Third, the effect of increased immigration flows was compounded by the decrease in the number of people emigrating from Britain, as fewer people went to work or retire abroad. 13These developments meant that the Conservatives approached the 2015 election campaign having singularly failed to deliver on one of their headline promises. 3 CONSERVATIVE PARTY, The Conservative Party Manifesto 2015, London: Conservative Party, 2015, p. 82. 14Given all of this it was perhaps surprising that the Conservatives chose to reaffirm their commitment to the net migration target in the 2015 campaign. The 2015 manifesto promised that they party would “keep our ambition of delivering annual net migration in the tens of thousands, not the hundreds of thousands”, and blamed the failure to do so – not entirely inaccurately – on the economic recovery.3 Presumably, the Conservatives took the decision that reneging on the commitment would do more damage than reasserting it as an ambition. As the campaign got under way it was unclear how this would play for the Conservatives, but it was certainly plausible to think that it could damage them, especially with UKIP in the ascendant. 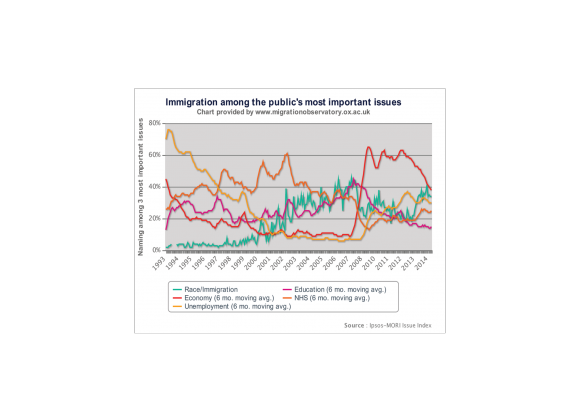 15Furthermore, immigration was by now a highly salient issue and something about which the electorate had strongly negative attitudes. IPSOS-Mori polls – if such things can be believed anymore – showed that immigration was considered by voters to be the second most important issue facing the country (See Fig 1). 16And the public had strong preferences for more restrictions on immigration. The 2013 British Social Attitudes Survey suggested that three-quarters of the British population wanted to see immigration reduced, and over half wanted it to be ‘reduced a lot’ (See Fig 2). 17Despite this, immigration did not figure in the campaign as much as might have been expected. The Conservatives did not want to draw attention to the high level of net migration while Labour had little to gain from politicising the issue. For both of the main parties immigration was, as it had been for some time, electorally risky and internally divisive. Immigration is generally an issue that splits both centre-left and centre-right parties, with the former divided between cultural conservatives and free market, pro-business interests, while the latter finds itself caught between left cosmopolitans and internationalists on the one hand, versus labour market and welfare protectionists on the other.4 In the specific context of the 2015 British election, these divisions had a particular resonance because were immigration to become a central aspect of the campaign, both Conservatives and Labour would find themselves having to defend an unpopular record – the Conservatives’ missed target and Labour’s record of policy liberalisation when it was in government. 18Thus while the Conservatives still enjoyed a lead over Labour on immigration they did not seek to make the issue a major part of their campaign. The Party’s two chief strategists – the Australian electoral strategist, Lynton Crosby, and the Chancellor, George Osborne – focused instead on the economic recovery (weak though it was) and how Labour’s alleged fiscal profligacy meant they could not be trusted with the reins of government. 19For its part, Labour did not seek to go on the offensive on the missed target because it was itself increasingly split on immigration and acutely aware of how many of its core voters thought the party had been too liberal when in office. Instead it staked out a largely defensive position to present itself as tough on immigration without really attacking the Coalition’s record. While parts of the party – including both some Blairites and left-wingers – thought Labour’s record in office should be defended, figures such as John Cruddas, who Ed Miliband had appointed as Policy Coordinator to write the party’s manifesto, successfully argued that Labour needed to adopt a robust line on immigration. Thus Miliband apologised for his party’s supposed mistakes in 2004-2010, admitting that the previous Labour government had been too sanguine about the effects of immigration, and he made tighter controls on immigration one of the party’s five election pledges. The pledge for “controls on immigration” adorned a much-derided campaign mug, as well as the even more derided “Ed Stone” – the surreal stone slab carved with Labour’s election pledges, which Miliband promised to put in the Downing Street garden if he was elected Prime Minister. 20There was an interesting parallel in all of this with the debate on the economy. On both issues, the Conservatives arguably had a poor record (most economists arguing that austerity was unnecessary and had in fact harmed the recovery) yet managed to present themselves as competent while depicting Labour as unreliable. And on both issues, Labour failed effectively to challenge this narrative – allowing the idea that they were to blame for the deficit and uncontrolled immigration to take hold. 21If Labour’s defensiveness on immigration is perhaps a necessary, it is not a sufficient condition, to explain how the Conservative’s immigration policy failure contributed to their electoral success. The missing piece of the puzzle is the United Kingdom Independence Party (UKIP), which unlike the major parties did campaign, and campaign vociferously, on immigration. 22As its name implies, UKIP began life as a party with the principal aim of withdrawing the UK from the European Union. Founded in 1991 as the Anti-Federalist League by Alan Sked, a Professor of History at the LSE, it was renamed UKIP in 1993. For many years UKIP was effectively a single-issue party, which drew its limited support from Eurosceptic Tories. It achieved some modest successes, but never looked likely to trouble the main parties. After a particularly poor performance in the 2005 general election, UKIP elected Nigel Farage, a sitting MEP, as its new leader. Farage set about trying to widen the party’s appeal with a broader right-wing agenda in an effort to pick up support from Tories alienated by (what they saw as) David Cameron’s socially liberal modernisation of the Conservative Party. 23From August 2010, when he was re-elected as leader following a brief hiatus, Farage developed a two-pronged strategy for UKIP: first, a focus on developing the party’s representation in selected local councils to create bridgeheads for national election campaigns; and second, adaptation of the party’s core message to target disenfranchised working-class voters. Election results revealed that UKIP was gaining support in areas with a large proportion of blue-collar voters. Conversely, it was doing badly in metropolitan areas with higher levels of education and significant ethnic minority populations. In other words, UKIP’s support was evolving from a reliance on dyed-in-the-wool Europhobes and the “disgruntled of Tunbridge Wells” to a more economically marginalised base. Under Farage, UKIP increasingly became a party of these “left behind” voters: working class, mostly white, and with few educational qualifications. 24The central issue chosen to develop this strategy to target the “left behind” was immigration. UKIP had been long arguing that European integration threatened British national sovereignty, but this was a relatively esoteric pitch, unable to galvanise voters whose concerns were more immediate and visceral than monetary union or Brussels “red tape”. Fortunately for UKIP, the EU and immigration had already begun to fuse as issues in the public mind following the 2004 enlargement round, when thousands of central and eastern Europeans exercised their new rights as EU citizens to move to the UK. As immigration from Poland and other A8 countries soared, significant parts of the public, especially those competing for jobs with the newcomers, began to express growing concern about immigration. This created an opportunity for UKIP to fuse its longstanding opposition towards the EU with an altogether more electorally potent issue. It was an opportunity Farage did not pass up. He set about refocusing UKIP’s core message on immigration, and on European immigration in particular. The only way the UK can effectively control immigration, he argued, is to withdraw from the EU. 25Thus UKIP morphed from being a fringe Eurosceptic party into a populist far right party, with immigration – especially though not exclusively from the EU – at the forefront of its campaigns. Its focus on EU free movement – rather than Muslim or other non-EU immigrants – distinguishes UKIP from some other populist far right parties in Europe, but in many ways it increasingly resembles them. As with other members of this party family it is nationalist, economically conservative (though it has shifted from a libertarian to more protectionist stance in recent years) and populist. In Farage it has a charismatic leader who, literally as well as metaphorically, likes to present himself as a “bloke down the pub”, in contrast to the cosmopolitan elite of the mainstream parties. 26This change has certainly widened the electoral appeal of UKIP, in terms of both the socio-demography and geography of its voters. Without losing its earlier support from Europhobic ex-Tories in southern England, UKIP has attracted growing support from white working-class voters across the country, including the Midlands and the North (their support remains more limited in Wales and especially in Scotland). Indeed, the stereotypical UKIP voter of the 1990s – a Blimpish ex-Tory living in southern England – is less and less important as an altogether different group has turned to the party. As Robert Ford and Matthew Goodwin pointed out in 2014, UKIP’s support has an increasingly clear social profile: “old, male, working class, white and less educated”.5 These are “disadvantaged and economically insecure Britons, who are profoundly uncomfortable in the ‘new’ society, which they regard as alien and threatening.”6 As with many other far right parties in Western Europe, UKIP’s support is nowadays founded on what Hans-Peter Kriesi calls the “losers of globalization”,7 the growing number of people for whom the economic, social and cultural changes of globalization are associated with insecurity and disadvantage, rather than growth and prosperity, and who feel alienated by mainstream parties who, they believe, represent the interests of cosmopolitan elites. 27An important implication of this, as Ford and Goodwin have been arguing for some time, is that UKIP now pose as much a threat to Labour as to the Conservatives. Where UKIP had once simply hived off voters from the right of the Conservative Party, it now stood to harm the Labour party by eating into its traditional working-class heartlands. While there was some limited evidence of this occurring already in the 2010 election it remained a matter of debate which party stood to lose more as a result of a UKIP surge in the run-up to the 2015 election. 29It remained to be seen whether the successes in the local and European elections could be repeated in the general election, and what effect this would have on the overall outcome. Could UKIP retain the support it had acquired in these second-order elections, where turn-out is lower and voters often protest against the main parties, and which moreover are governed by more proportional electoral systems, unlike the Fast Past the Post system of single member constituencies, which is notoriously difficult for smaller parties? 30UKIP’s core message in the general election campaign was essentially the same as in the EP elections. Although Farage himself fought what many thought a lacklustre campaign, he still managed to generate media controversy by using the televised leaders debate to attack migrants for health tourism, and on another occasion blaming his late arrival at a meeting on traffic congestion caused by “open door immigration.” Unlike Labour, UKIP did make the Conservative’s failure to meet its net migration target an issue. Indeed, one of its general election campaign posters was a (quite clever) variation on a theme of a one of its 2014 European election posters. While the 2014 version depicted an escalator running up the white cliffs of Dover with the caption “No border. 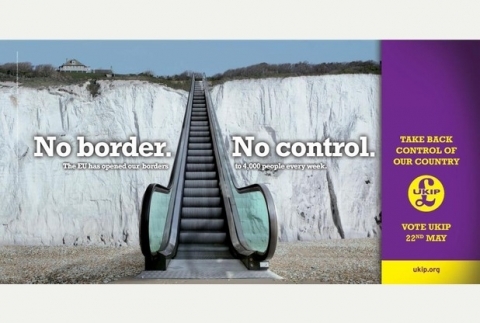 No control”, the 2015 poster used the same imagery but with three escalators to represent the idea that “Immigration is three times higher than the Tories promised” (see Fig. 3). 31In the event, UKIP did both spectacularly well and spectacularly badly. The bad news was that UKIP returned just one MP: Douglas Carswell, a former Conservative who had defected to UKIP in 2014. This was in stark contrast to some predictions that they could win in several tight contests. Perhaps most disappointing was the result for Farage himself. Despite concentrating his efforts on the constituency of South Thanet, he failed to win, prompting his immediate (albeit short-lived) resignation. 32But in terms of its popular support the UKIP surge held up pretty well. Across the UK the party received 12.6 per cent of the vote, and in England, 14 per cent. Their total vote share – nearly four million votes – was as large as the SNP and the Lib Dems combined (who between them managed to win 64 seats). Moreover, UKIP came second in more than 120 seats. In terms of the influence of UKIP’s rise on the outcome of the election, it was here that the effect was felt. 33Indeed, in 2015 the chief significance of UKIP’s large popular vote spread across many constituencies lies in the effect that it had on the two main parties’ performance. In short, while both the Conservatives and Labour lost votes to UKIP, the electoral damage was greater for Labour. In numerous key marginals, especially in the Midlands and the North of England, UKIP prevented Labour from taking seats they simply had to win from the Tories. 34Before demonstrating this, it is worth pausing to observe how counter-intuitive it is, at least if one assumes (not unreasonably) that an incumbent party’s policy record on high salience issues might be expected to affect its electoral fortunes. Given that UKIP campaigned on immigration and indeed sought to make the Conservative’s migration policy failure an electoral issue, it might have been expected that the Tories, as the governing party (strictly speaking, the main party in a coalition) that had presided over an increase in immigration, would be damaged most. However, while there were voters who abandoned the Tories for UKIP over immigration, the more significant effect appears to have been Labour voters shifting to UKIP for the same reason. In other words, while it was the Conservative-led coalition that presided over increasing net migration, it was Labour that bore the brunt of public frustration on the issue. Thus Conservative policy failure contributed towards political success. 35Of course immigration was not the only factor that caused voters to defect to UKIP: a general disaffection with the mainstream parties and opposition towards the European Union – to the extent that they can be separated from immigration – were also important. But immigration was undoubtedly a major factor, especially among former Labour voters. 36To see how UKIP’s rise contributed towards Conservative victory by harming Labour we can compare the results of the Conservatives and Labour in constituencies where UKIP performed very well versus constituencies where UKIP performed relatively badly. As Steve Fisher has pointed out, where the UKIP vote was up over 14 per cent on their 2010 result, the Conservatives were down 0.9 per cent and Labour up 1.6 per cent (see Table 1).9 At first glance, then, it appears that UKIP harmed the Tories. However, to gauge the UKIP effect on each party’s relative performance what really matters is the difference in each party’s vote in these seats compared to those where UKIP was not doing so well. In those constituencies where the UKIP vote was up by less than 7 per cent, the Conservative vote was up by 1.5 per cent while the Labour vote was up by 6.9 per cent. Therefore, Labour (which remember increased its total UK vote share by 1.5 per cent compared to 2010) was up 5.3 per cent less where UKIP did well, whereas the corresponding difference for the Conservatives was 2.4 per cent. Thus in terms of the popular vote, UKIP hurt Labour more than they hurt the Conservatives. Source: Author’s recalculations based on Fisher 2015. 37This effect is even clearer at the level of constituency results, where UKIP stopped Labour taking seats from the Tories. In constituencies where UKIP did less well (up <7%), Labour managed to take 6 seats from the Tories. In contrast, where UKIP was polling strongly (up >14%) Labour did not take a single seat from the Tories. Especially given the collapse of the Labour Party in Scotland (where of course it faced the even more dramatic SNP surge), it was these Tory-held English marginals that Labour had to win to have any chance of forming a government; and it was here that Labour defectors to UKIP helped the Conservatives. 38There was a strong regional aspect to this effect. One post-election study by the polling firm Survation found that while UKIP took more votes from the Conservatives than from Labour in some parts of the country, in the North of England and possibly also in the Midlands UKIP took 10-15 per cent more of its vote from Labour than from the Conservatives.10 According to their poll of people who voted Labour in 2010, in the North of England, where Labour lost 16 per cent of its 2010 voters, and in the Midlands, where it lost 11 per cent, the largest share of lost votes went to UKIP. In the South of England, Labour lost an even higher proportion of its 2010 vote, but here voters broke roughly equally to the Conservatives (38 per cent) and UKIP (36 per cent). Only in London and Scotland did UKIP not take votes from Labour. 40It is widely known among political scientists who study migration that immigration policy is replete with unintended consequences. Yet rarely can the political consequences of a migration policy have been quite so perverse as the case discussed here. Over the course of five years, the Conservatives’ failure to achieve a high profile commitment, one that was intended to help them win the 2010 election by capitalising on their lead over Labour and stemming defections to UKIP, became an electoral benefit by prompting defections of former Labour voters to UKIP. Counterfactually, had the Tories achieved their net migration target, which would have meant very substantial reductions in immigration, it seems likely that public opposition towards immigration and thus UKIP’s appeal would have been diminished, and fewer Labour voters would have responded to Farage’s populist anti-immigration message. 41It is tempting to think that George Osborne and Lynton Crosby, the two chief architects of the Conservatives’ victory, may have sensed this and were happy to let public anxiety about immigration run high assuming that defections to UKIP were likely to harm Labour more than their own party. If that was their political calculus then it was a canny one, and it helps to explain why the net migration target was reiterated in the 2015 manifesto. Whether or not this is true – and it is only speculation – it is clear is that far from harming the Conservatives, failure to reduce net migration, let alone meet the target, helped them to victory. A promise made in 2010 had become a promise broken in 2015; but the latter was even more politically advantageous. 42The wider lesson here is that there is such thing as a politically successful policy failure. Contrary to the logic outlined at the start of the paper, this case shows that under certain circumstances an incumbent’s failure to achieve its policy goals, even on a highly salient issue, can not only not matter, but may even contribute towards electoral success. It may sometimes be to the advantage of an incumbent party to set themselves up to fail, or at least be at ease with their apparent failure, if they can see a positive political externality. Of course, all of this depends on the caveat ‘under certain conditions’, which in this case involved an insurgent party increasingly campaigning on the issue where the incumbent party had “failed”, but where voter concern was concentrated among core supporters of the opposition party. This is, of course, a rather specific set of circumstances. And while it is possible to be wise after the fact, the implications were far from certain in real-time, as they depended on how unpredictable party political dynamics and issue salience would influence voter behaviour. 43Whether the trick will work twice remains to be seen. Unless they renounce or quietly resign the target mid-Parliament, neither of which seems likely, the Conservatives will go into the 2020 election once again defending their record on net migration. Given that there is no more reason to believe that the target will be achieved this time, the theory of successful failure may well be put to the test once again. Some of the key variables shaping how this unfolds will be whether immigration remains as salient an issue for voters in 2020 as it is today, whether UKIP continues to build upon its populist anti-immigration, anti-EU message, which in turn will depend on whether the UK is still in the EU following Cameron’s in/out referendum, and whether Labour is able to wrest back some of the votes it lost to UKIP. Given this, it would be unwise to assume that migration policy failure will be so advantageous to the Conservatives again. BALE, T. “Turning Round the Telescope: Centre-right Parties and Immigration and Integration Policy in Europe”, Journal of European Public Policy, vol. 15, no 3, 2008, pp. 315-330. CONSERVATIVE PARTY. The Conservative Party Manifesto 2015. London: Conservative Party, 2015, p. 82. FORD, R., & GOODWIN, M. Revolt on the Right: Explaining Support for the Radical Right in Britain. London: Routledge, 2014, p. 336. HAMPSHIRE, J. The Politics of Immigration: Contradictions of the Liberal State. Cambridge: Polity, 2013, p. 224. HAMPSHIRE, J., & BALE, T. “New Administration, New Immigration Regime: Do Parties Matter After All? A UK Case Study”, West European Politics, vol. 38, no 1, 2015, pp. 145-166. KRIESI, H., GRAND, E., DOLEZAL, M., HELBLING, M., HÖGLINGER, D., HUTTER, S., & WÜEST, B. Political Conflict in Western Europe. Cambridge: Cambridge University Press, 2012, p. 368. 1 OFFICE FOR NATIONAL STATISTICS, Migration Statistics Quarterly Report, May 2015, consulted on 3 August 2015 at http://www.ons.gov.uk/ons/rel/migration1/migration-statistics-quarterly-report/may-2015/sty-net-migration.html. 2 See J. HAMPSHIRE & T. BALE, “New Administration, New Immigration Regime: Do Parties Matter After All? A UK Case Study”, West European Politics, vol. 38, no 1, 2015, pp. 145-166. 4 See James HAMPSHIRE, The Politics of Immigration: Contradictions of the Liberal State; Cambridge: Polity, 2013, p. 224; Tim BALE, “Turning Round the Telescope: Centre-right Parties and Immigration and Integration Policy in Europe”, Journal of European Public Policy, vol. 15, no 3, 2008, pp. 315-330. 5 R. FORD & M. GOODWIN, Revolt on the Right: Explaining Support for the Radical Right in Britain, London: Routledge, 2014, p. 159. 7 H. KRIESI, E. GRAND, M. DOLEZAL, M. HELBLING, D. HÖGLINGER, S. HUTTER, & B. WÜEST, Political Conflict in Western Europe, Cambridge: Cambridge University Press, 2012, p. 368. 9 Stephen FISHER, “How Did the Tories Win a Majority?”, Elections etc. blogpost, 8 May 2015, consulted on 3 August 2015 at http://electionsetc.com/.